Tara Iti and Bonnieux represent the stable on the synthetic track at Geelong on Friday. Tara Iti (pictured) is the first to go in race one, the Maiden Plate over 2200m and drawn the outside of 12 runners. The son of Shocking is starting to get out to a trip trainer Mike Moroney believes will suit the son of Shocking. “Finally able to get him out in trip which is going to suit him and he’s a lot fitter for today after two runs back,” Moroney said. Moroney has always had an opinion of Tara Iti as a staying prospect and is looking forward to testing him at 2200m. “The race today gives us an opportunity to have a real good look at him over a suitable distance,” Moroney said. “It’s a pity he’s drawn the outside and he doesn’t have a great amount of gate speed so it will be up to Patrick to make the best of it. In contrast, Bonnieux has drawn nicely in race three, the Fillies and Mares Maiden Plate over 1200m. The daughter of Choisir will jump from barrier two with Patrick Moloney in the saddle. “It’s not the easiest race for her to have her first start but that’s what you get in the spring and she’s ready to go,” Moroney said. “She’s improved and improved into the preparation she has shown gate speed in her jumpouts so the barrier will certainly help. 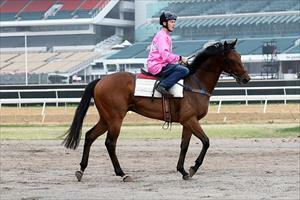 “She’s done a lot of work on the synthetic track here at Flemington so we’re anticipating she will cope with the track.